Simple Orange Cranberry Icebox Cookies are the perfect treat to welcome spring! Easy to make and ideal for an Easter Brunch or a picnic in the park. Slice and bake cookies are so simple to make. Plus, they’re fabulous to have on hand if you have unexpected guests or a late night sweet tooth, or both! Also known as refrigerator cookies, icebox cookies are slice and bake cookies. Most often the dough is rolled into a ballotine (log shape) in plastic wrap. Here we’ve used a loaf pan lined with parchment paper to create a layered cookie. After the layers are created, then we use plastic wrap to seal the top and gently press the dough. Why do I have to refrigerate cookie dough? We actually prefer to chill almost all of our cookie dough recipes. At least a couple of hours and usually overnight, it was the standard custom in our bakery, for a couple of reasons. It allows the butter in the mix to firm back up, keeping the cookies from spreading too much during baking, so they maintain their shape and don’t overcook. In addition, it enables the flavors to marry! This is purely a long-standing tradition and one I’ll always follow. If you can’t wait overnight give the dough at least a couple of hours to set. Combine the flour, baking powder, and Pink Himalayan sea salt in a bowl, stir until combined set aside. Cream the butter and sugar on medium-high until light and fluffy. Then add in the egg, vanilla, and milk and beat until combined. Add the flour in 2 batches, mixing thoroughly after each addition. After all of the flour is blended in, transfer 1 cup of the dough to a small bowl; stir in the orange zest and set aside. Add the cranberries, pan roasted pecans, and red gel food coloring to the remaining dough (that you removed 1 cup from for the orange zest). Mix by hand until fully incorporated. Add the white chocolate chips and fold in by hand with a flat bottomed wooden spatula, mix until blended. Then divide this pink dough in half to create the layers. 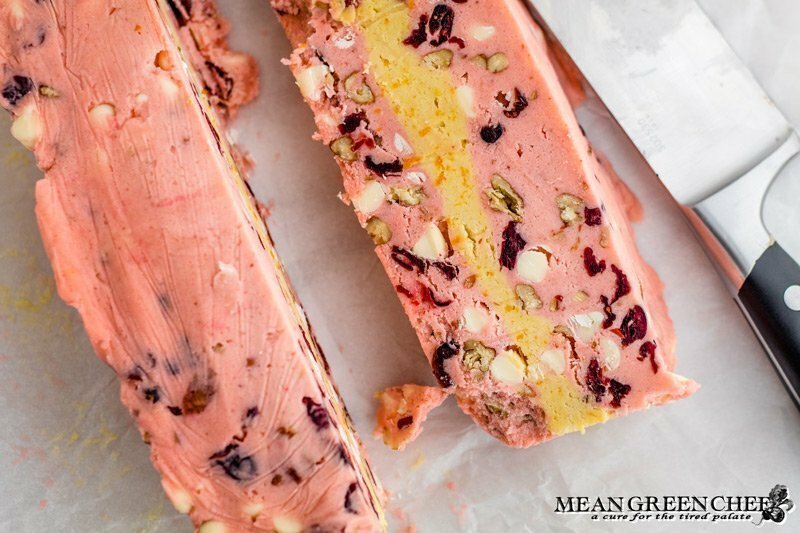 Line an 8×4-inch loaf pan with parchment paper, press one half of cranberry dough evenly into the bottom of the pan. Finally spread the remaining cranberry dough on the top. Tear a piece of plastic wrap and smooth over the top while gently pressing the dough down. Refrigerate for 2 hours or until chilled. We let ours sit overnight. Remove dough from pan; cut in half lengthwise, cut each portion into 1/4-in. slices. Place 1 in. apart on parchment lined sheet pan. Bake at 375°F/190°C for 8-10 minutes or until edges begin to brown. Remove to wire racks to cool completely. Combine the flour, baking powder, and Pink Himalayan sea salt in a bowl, mix and set aside. Transfer 1 cup of the dough to a small bowl; stir in orange zest and set aside. Add the cranberries, pan roasted pecans, and red gel food coloring to the remaining dough (that you removed 1 cup from for the orange zest). Line an 8x4-inch loaf pan with parchment paper, press one half of cranberry dough evenly into the bottom of the pan. Remove dough from pan; cut in half lengthwise. Cut each portion into 1/4-in. slices. Place 1 in. apart on parchment lined sheet pan. Bake at 375°F/190°C for 8-10 minutes or until edges begin to brown. Remove to wire racks to cool completely. Store in an airtight container in a cool dry place up to 7 days. Here are a few of our other cookie recipes and Conversion Charts. Also Shared on these great Blog Hops! Looking to Grow Your Blog? Then be sure to check out our directory to 100+ Link Parties! This recipe looks delicious, it also looks like an ice cream. I agree that this is perfect for late night snacks or for movie night. Thank you for sharing this recipe. Thanks for sharing at the What’s for Dinner party. Have a great week! These are so pretty, Angela and they sound delicious too! I’ve just shared this post on the Hearth and Soul Facebook page. Thank you so much for bringing this delicious recipe to the Hearth and Soul Link Party!